Lauren Chase gets into her car to go to work one day and just keeps driving. She isn't ready to face the news she knows will be waiting when she gets home. A day away from life will be just what she needs. But she doesn't expect to get lost in a giant cloud of dust or arrive in a strange town called Lost. Everything seems just a bit off in this place where random possessions litter the streets. The people she meets inform her that she can't leave the town until she figures out what she has lost. But she isn't missing anything...or is she? This is one of those situations where I am glad I listened to my gut. This is a little out of my reading comfort zone, but I couldn't help requesting a copy. The idea of a singular place where lost things congregate is fascinating. We meet people who have lost their way, lost their dreams, and lost their memories. The town of Lost is literally comprised of lost items - everything from the change you lost in the couch cushions to entire homes. The characters must discover what they have lost. At that point, a mysterious person known only as The Missing Man appears and will help you to go back home. I loved the whimsy in this story. The parallels to beloved childhood tales like Alice in Wonderland and Peter Pan abound, and Durst understands that the necessary companions of joy and magic are danger and loss. We also witness that oldest of fairy tale tropes - was it real? Did I dream or imagine that? What does it mean if I can go to this magical place but others can't? Lauren's story is about finding a balance between caring for others and doing things for yourself. Before finding herself in Lost, she had given up her dreams of being an artist to take a responsible job that allowed her to care for her mother as she battled cancer. Lauren was being responsible grown-up...and she was miserable. In Lost, she also finds herself in a role where she helps others but in doing so, she discovers the things that make her happy and finds herself again. She is also in the transitional part of her life where we go from having a built-in family to creating our own. While Lauren very much loves her mother, she recognizes that their time together is short. As she begins to create a tribe of her own with an enigmatic man named Peter and Claire, a fierce little girl, you can't help but root for their tiny family to survive and thrive. 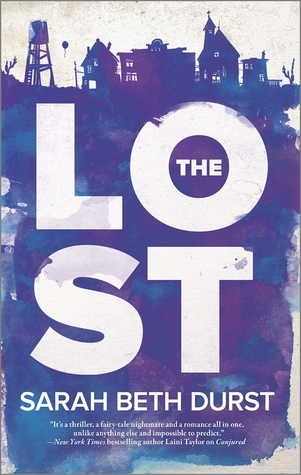 The Lost is a unique story that also invokes beloved childhood tales while grappling with some of the toughest issues of adulthood. I'm so glad I gave this book a try and I will be looking for the sequel in November. A little off my own comfort zone but one I am willing to step out of. Thanks for the review. I was happily surprised by how much I enjoyed it. I hope you do too! Wonderful! I can't wait to hear what you think. Lindsey, this book sounds so wonderful to me right now. I say sometimes that a book is out of my comfort zone, but I do read an eclectic selection and this one is calling to me! You posted a great review; I have read a couple of other reviews and still couldn't decide, but after yours I am definitely in, so thanks!